Have you ever lost your temper over trivial matters? Stuffed your anger deep inside? Sulked because you didn't get your way? Felt lost in an increasingly confusing modern world? If so, you may not be in control. Redford Williams, MD, and Virginia Williams, PhD, are internationally recognized as experts in behavioral medicine. Together, they have developed a clinically proven program that reduces depression and helps people to lead healthier, more successful lives. You'll start by taking a 30-question self-assessment quiz, which will pinpoint your trouble areas. For eight weeks, you'll then focus on each of those areas, learning to control your reactions, problem solve with creativity, assert yourself, and respond to difficult situations with poise and confidence. 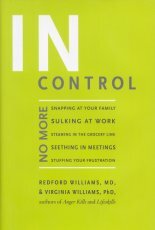 Based on cutting-edge research by Redford and his colleagues, In Control draws on the most exciting developments in the field of behavioral medicine. With this easy-to-follow book, you'll learn to handle anything -- from stress at work to traffic jams and grocery store lines.